A thermocouple consists of two different types of wires (i.e copper and iron). The ends of wires are joined together to form two junctions (hot and cold junction). If two junctions are at different temperatures, a small voltage (or emf) is produced. The greater the difference, the greater the voltage produced. 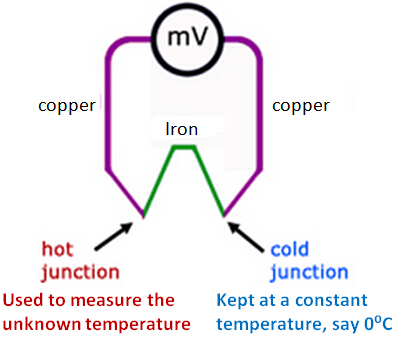 Note that if two junctions are at same temperature, no reading will be observed.